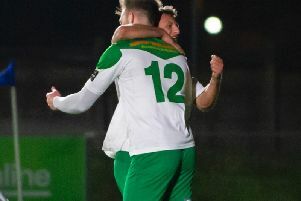 Bognor manager Jamie Howell has expressed his regret at the scenes that marred the end of Monday night’s 2-1 win at Kingstonian and took some of the gloss off the result. The incident saw Ks keeper Rob Tolfrey confront a Bognor fan on the terraces after the final whistle and Howell said with an investigation under way involving both clubs, he was unable to comment on the details of what happened. But Howell said: ‘What we’d all agree on is that there’s no place for scenes like that in football. ‘We should have come away talking about an excellent result and instead a lot of the focus is on that. ‘Sometimes, trying to pacify people and calm things down can seem like you are trying to get involved and it’s very difficult. What we’d all agree on is that there’s no place for scenes like that in football. The film of the incident also showed a row breaking out between players of the rivals teams at the end of the match. Police were also called to the stadium. A spokesperson for the Metropolitan police said the incident was being investigated, saying in a statement: ‘Police were called at 21.43 on Monday, February 23 to Kingsmeadow Stadium, Jack Goodchild Way after reports of a fight between players and supporters.